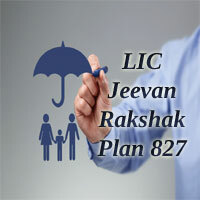 LIC Jeevan Rakshak (Plan 827) is a regular premium paying participating non-linked Endowment plan. Jeevan Rakshak is a traditional plan which provides a fusion of protection and savings. Jeevan Rakshak Plan offers financial support for the family in case of unfortunate death of the life assured any time before maturity and a lump sum amount at the time of maturity for the surviving Insured. LIC endowment Jeevan Rakshak policy also takes care of liquidity needs through its loan facility. The UIN code of Jeevan Rakshak endowment plan is 512N289V01. This LIC endowment plan shall be available to regular life only under a non-medical limit, and the total Sum Assured under this plan shall not exceed Rs. 2,00,000/-. Let’s check the key features, Benefits, rebates regarding Jeevan Rakshak Plan at a glance. Jeevan Rakshak Traditional Plan with Bonus facility which offers you the dual benefit of savings and protection. Check the LIC endowment plan- Jeevan Rakshak salient features here. LIC Jeevan Rakshak is a With Profit Endowment Assurance Plan. Jeevan Rakshak is a Regular Premium Paying endowment plan. No Medical Check up: Under this endowment plan, medical check up is not needed. Jeevan Rakshak Endowment Plan is a fusion for Savings & Protection needs. Loan facility is available: Under Jeevan Rakshak 827 after payment of premiums for at least three years. The Bonus is given in the form of Loyalty Additions after completion of Five policy years. LIC Jeevan Rakshak endowment plan offers customized policies that can surround almost any Saving need that insured might have. Check the eligibility conditions for the Jeevan Rakshak Endowment plan in the following section. Maximum 55 years (Nearest Birthday). Maximum 70 Years (Nearest Birthday). LIC Jeevan Rakshak endowment plan provides a reliable tool for increasing funds and offers a life cover to the life assures. Here we are presenting the essential benefits of LIC endowment (Plan 827). Let’s have a glance on the benefits offered by the LIC endowment plan in the following section. Death Benefit: On the passing of the Life Assured during the policy term “Sum Assured on Death” shall be payable. Ten times of annualized premium. 105% of all the premiums paid as on date of death. In addition to the above benefits, Loyalty Addition, if any, shall also be payable if death occurs after completion of the fifth policy year. Maturity Benefit: If life insured survive till the end of the policy term then Basic Sum Assured + Loyalty Addition, if any, shall be payable. Participation in Profits: Provided the policy is in full force, then depending upon the insurance company experience the policies under Jeevan Rakshak Plan will be eligible for Loyalty Addition. Double Accident Benefit: Allowed with Additional Premium. Free Look Period: If life assured is not satisfied with “Terms & Condition” of Jeevan Rakshak policy he/she may return policy to Insurance company stating reason within 15 days from the date of commencement of policy. Grace Period: A grace period not less than 30 days will be allowed for payment of yearly, half-yearly or quarterly premiums and 15 days for the monthly mode of premium payment. Revival: Two consecutive years from the date of first unpaid premium. Loan: Loan facility is available under Jeevan Rakshak plan, after payment of premiums for at least Three full years. Under Jeevan Rakshak endowment plan an optional Accident Benefit Rider is available. Get an idea about LIC Accident Benefit Rider. LIC Accident Benefit Rider: Under LIC Jeevan Rakshak Accident Benefit Rider is available as an optional rider by payment of additional premium. In the case of accidental death, the Accident Benefit Sum Assured will be payable as lump sum along with the death benefit under the basic plan. The Maximum any policy anniversary during the policy term. Maximum age Same as under the basic plan. Maximum of Rs. 50,00,000/- overall limit taking all existing policies of the Life Assured under individual & groups. Check the Sample Premium Rates here. Following are some of the sample tabular annual premium rates per Rs. 1000/- Basic Sum Assured. Let us check the LIC’s Jeevan Rakshak Endowment Plan Rebates here. If LIC Jeevan Rakshak Policy completed under CEIS (Corporation’s Employee Insurance Scheme) will be eligible for the Rebate. Check the CEIS Rebate Rates. The LIC Jeevan Rakshak Endowment Plan buying procedure is available here. Before purchasing the LIC New Endowment Plan- Jeevan Rakshak, insured should read the Plan details carefully. The Client can get this New LIC Endowment Plan -Jeevan Rakshak policy in two ways either online or offline. For Online mode, refer the LIC India Official Website. For offline mode, Visit the nearest LIC Branch Office or Contact an LIC Agent of superior guidance. Get the documents required for the LIC Endowment Plan 818 here. Proposal Form Annexure – 4 / Application Form along with the Photograph. Age proof of the Life assured. Address Proof ( Nominee & Life assured). The policyholder can claim the Jeevan Rakshak Endowment plan offered by LIC, India after the completion of the policy period. In the case of eventual death of the policyholder, the nominee can claim instead of the Life assured. Let us have a glance at the documents required for Claim the LIC Jeevan Rakshak Endowment Plan here. Original Policy Document / Bond. Proof of Death ( If in the case of the eventual death of the life insured). LIC Jeevan Rakshak Premium Calculator is used to calculate Premium amount for yearly, half-yearly, quarterly and monthly of any Policy. This LIC calculator is used to estimate the benefits offered by the Jeevan Rakshak Plan. Jeevan Rakshak endowment Calculator provision helps you to calculate the premium amount and amount paid to the insured (or his/her family) after maturity. For more details regarding LIC Jeevan Rakshak Premium Calculator, additional information refer www.policybook.in. Let’s Check the regarding Jeevan Rakshak Endowment plan in the following section. If after at least three full years premium have been paid, and any subsequent premiums are not duly paid, then Jeevan Rakshak Plan shall not be wholly void, but shall subsist as a paid-up policy. The Basic Sum Assured under the policy shall be reduced to such a sum, called Paid-up Sum Assured, and shall bear the same ratio to the Basic Sum Assured as the number of premiums actually paid bears to the total number of premiums originally stipulated for in the policy i.e. Basic Sum Assured *(no. of premiums paid I Total number of premiums payable). The Jeevan Rakshak Endowment policy can be surrendered at any time during the policy term provided at least 3 full years premiums have been paid. Taxes including Service Tax, if any, shall be as per the Income Tax laws and the rate of tax shall be as applicable from time to time. No reinsurance is required for policies taken under this endowment plan.